While businesses and payroll departments around the country wait for the results of the debate on the 2012 payroll tax cut, our Payroll Software engineers are planning for the different scenarios. 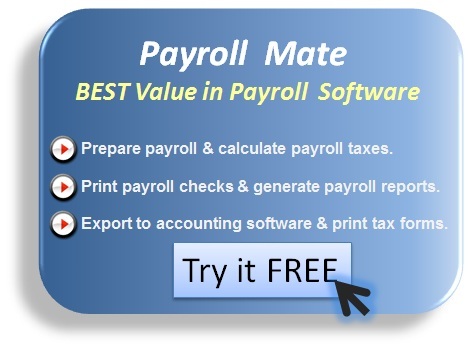 No matter what the lawmakers decide, Payroll Mate will be among the very first payroll applications to implement the new changes. 1. The 2 point cut in the employee portion of social security tax expires on December 31, 2011 and the rate goes up to 6.2% (the rate for 2011 is 4.2%). 2. The current 4.2 percent employee social security rate gets extended until the end of 2012. 3. The employee portion of social security tax gets reduced to 3.1 percent (from 4.2%) for 2012 with no change on the employer portion which is currently 6.2%. 4. The social security tax gets reduced to 3.1 % for both the employee and employer. The current 2011 payroll tax cut, enacted as part of the “stimulus package” in 2010, has affected the paychecks of employees by reducing their portion of Social Security taxes from 6.2% of gross pay to 4.2%. A family with income of $50,000 a year would pay $1,000 more in payroll taxes if Congress does not act by the end of 2012 to extend that reduction.